You ask for a cheesecake, I give you a cheesecake. This is one of the richest cheesecake recipes ever. It is an amazing cheesecake that everyone always has room for no matter how much they’ve eaten! True story: I once went to dinner with my entire family to the famous Embers Restaurant in Miami Beach. was better than the one we sold in the store, he’d fire the baker. while still cheesy and creamy. He didn’t fire the baker. He found a way to get their recipe. I won’t suggest that he stole it, buuuuttttt…. All he did was get the baker to make ours even better. There’s a secret, and it’s buried inside this recipe. 1. Mix the crust ingredients well, until they bind together and form a ball. 2. Press firmly into the bottom of a 10-inch spring form pan, and about a half inch up the sides. 3. Bake at 375 degrees for 10 minutes, then cool on a wire rack. 3. Pour into the spring form pan when the crust is cooled to the touch. 4. Mix one 4 ounces of sour cream and 4 TBSP of sugar until the sugar dissolves completely, then spread the sour cream on top of the cake, leaving a half inch uncovered around the edges. 5. Bake in preheated 350-degrees-F oven for 1 hour, then turn off oven and leave in closed oven for one hour longer. Cool on rack. 6. After the cake is completely cooled, place one cup of clear strawberry jelly, 6 TBSP of good Amaretto, and a teaspoon of cornstarch in a small saucepan and heat them together, mixing constantly, until they are completely blended and the sauce thickens to coat a spoon. 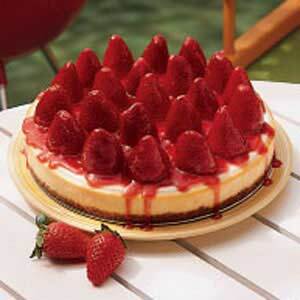 Cap two quarts of fresh strawberries, and cut the tops off so that they will sit flat with the points up Arrange them beautifully on top of the cheesecake, and then drizzle the jelly-Amaretto mixture over the strawberries, then chill until the glaze sets.